"I was born in Oxfordshire in 1979. I started drawing as a young child and my love affair with art continued throughout school and then College where I attained my BA honours degree. 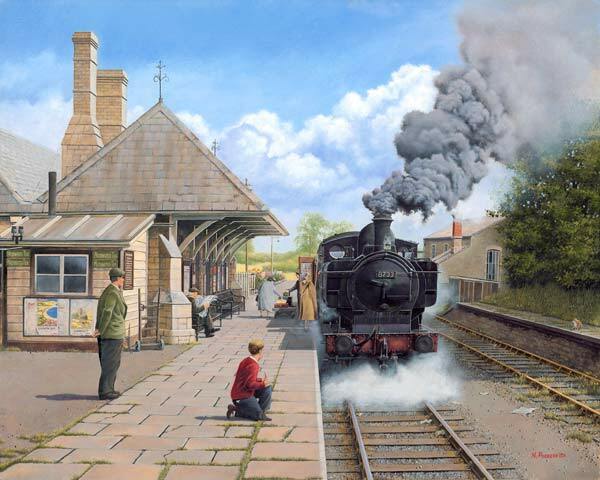 As with many other young boys in generations past, I had a keen interest in steam locomotives. This subject proved to become the basis for my first foray into the commercial art world. I enjoy immensely the technicalities that mechanical form has. Especially in the case of steam locomotives, I feel great passion for the atmosphere that those seething, clanking, fire eating titans create and although cast of iron, steel, brass and copper I have always felt that they share a mortality with us. Every last element that I can discern visually I attempt to incorporate into my paintings. I take the greatest pleasure in using the medium of oil paint, as I feel it responds well to my style". 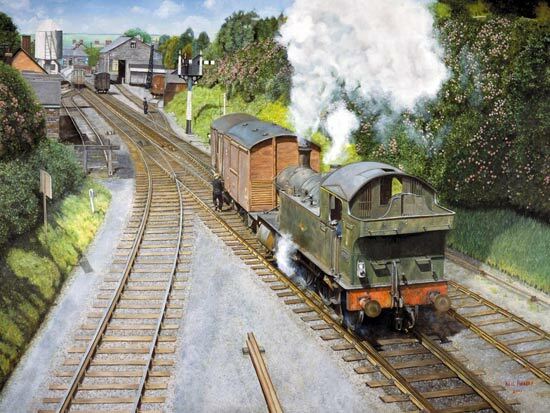 Great Western Railway 2-6-2 tank engine shunting vans at Bodmin General Station in 1961. Oxford Station - British Railways last steam loco - class 9F Evening Star on 'The Bathgate' car carrier service seen in the early 1960's. A 3.5 mile branch line was opened in 1864, between Faringdon, Oxfordshire and the Great Western Railway mainline at Uffington. Passenger services were withdrawn in 1951. Freight traffic continued to use the line until 1964. The station building is now used a nursery school. 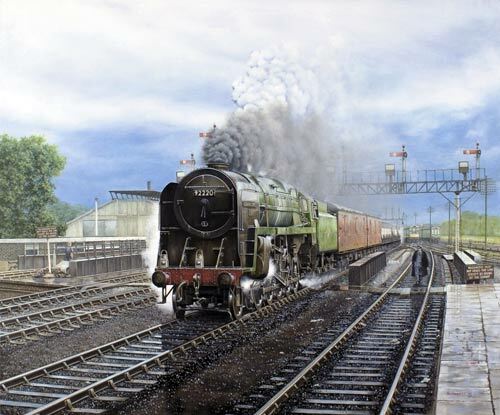 Gresley A4 No. 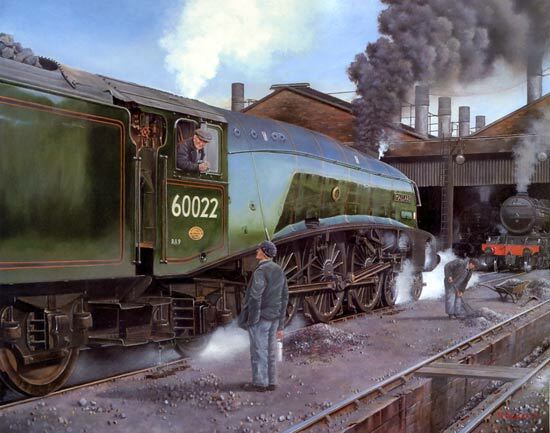 60022 Mallard on shed in 1963 - Mallard is the holder of the world speed record for steam locomotives at 126 mph. This record was achieved on 3rd July 1938 south of Grantham on the East Coast Main Line between Little Bytham and Essendine.